Multistyle violinist and champion fiddler Mari Black is rapidly building a reputation as one of the most dynamic young artists of her generation. Her energetic playing, engaging stage presence, and commitment to bringing people together through music have made her a favorite with audiences across the country and around the world and she captivated the audience at last year's Summer Solstice Festival. Equally at home in a wide variety of musical traditions, Mari is the 2015/2013 U.S. National Scottish Fiddle Champion, 2014 Glenfiddich Scottish Fiddle Champion, 2014/2012 Canadian Maritime Fiddle Champion, 2011 Canadian Novelty Fiddle Champion, and 2-time laureate at the American String Teachers' Association Alternative Styles Awards. 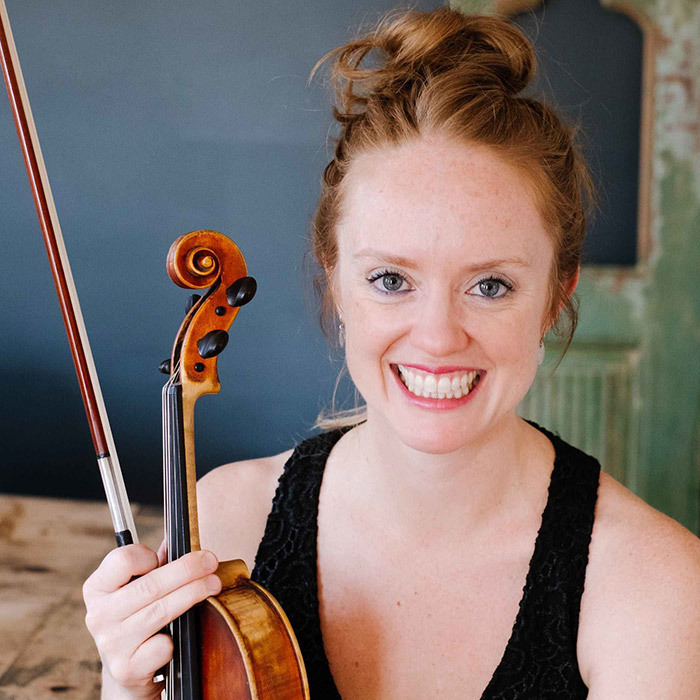 On stage, she creates shows that draw on elements from many different styles including jazz, tango, folk, and classical while specializing in Scottish, American, and Canadian fiddling. Mari is currently touring nationally with her trio, the Mari Black World Fiddle Ensemble, performing and celebrating diverse styles of traditional and modern dance music. Joining Mari this evening are David Surrette on guitar and Joe Magar on bass. Fellswater is a dynamic Celtic music ensemble based out of Boston playing a wide range of music from traditional to modern compositions, drawing from the music of Scotland, Ireland, Brittany and Canada. Instrumentation includes whistle, flute, guitar, bouzouki, violin, Scottish small pipes, and percussion. Fellswater has delighted audiences at New Hampshire Highland Games (2010, 2012, 2014), Maine Highland Games (2014), Blackstone River Theatre (2012, 2013 and 2015), Colonial Williamsburg (2014 and 2015) and the Royal Nova Scotia International Tattoo (2015). The band has released two well-received albums, "Fellswater," in 2010 and "Thursday Night," in 2013. Fellswater will appear at the prestigious Royal Edinburgh Military Tattoo in 2018. The 6-piece band features Elizabeth Ketudat on fiddle, Sarah MacConduibh on Irish flute and whistle, Andrew McIntosh, a former pipe major of the Stuart Highland Pipe Band, on Scottish small pipes and border pipes, Chris Myers on vocals, guitar, and octave mandolin, Diane Myers on vocals, and Kyle Forsthoffon bodhran and percussion. 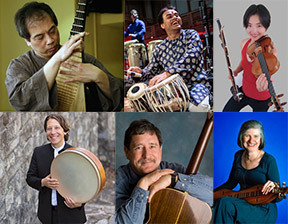 This very special show will be a Celebration of the Chinese New Year as Blackstone River Theatre welcomes Ed Sweeney with four members of Yo-Yo Ma's Silk Road Ensemble - Yang Wei on pipa, Sandeep Das on tabla, Shane Shanahan on percussion, and Shaw Pong Liu on violin and erhu. Ed Sweeney performs a wide-ranging repertoire of traditional music, ragtime and blues on 6- and 12-string guitar, 5-string banjo, and fretless banjo. Sweeney's 2015 CD with Yang Wei, "What Lies Ahead," a collaboration of traditional Chinese music and traditional western music, grew from the friendship that was formed between the two in 2008 when Ed was introduced to Yang Wei after a performance of the Silk Road Ensemble with Yo-Yo Ma in Chicago. That friendship grew into performances in Chicago, Rhode Island and Taiwan. Representing a global array of cultures, Silk Road Ensemble musicians co-create art, performance, and ideas. The Ensemble has been called "vibrant and virtuosic" by the Wall Street Journal, and a "roving musical laboratory without walls" by the Boston Globe. Formed by Yo-Yo Ma in 2000, the Ensemble's music is contemporary and ancient, familiar and foreign, traditional yet innovative, and draws on many traditions from around the world to create a new musical language that reflects our 21st-century global society. Since the Tang Dynasty (618-907 C.E. ), the pipa - a short-necked wooden lute - has been one of the most popular instruments in China. Yang Wei is a young pipa virtuoso. Yang Wei, a young pipa virtuoso, has been celebrated worldwide, performing for audiences throughout Asia, Europe, and the U.S. By age 18 he performed as a soloist with the National Shanghai Orchestra. In 1989 Yang Wei received First Prize for the International Chinese Musical Instruments Competition in the Young Professional Pipa section. He moved to the United States in 1996. In addition to performing as a soloist with orchestras around the world, he has toured with the acclaimed Silk Road Ensemble since 2000, performing alongside world-famous cellist Yo-Yo Ma. Sandeep Das is one of the world's leading tabla virtuosos. He has composed for and performed internationally with the Silk Road Ensemble since the group's founding in 2000, and is a Grammy-nominated recording artist in his own right. Percussionist, composer, and arranger Shane Shanahan has combined his studies of drumming traditions from around the world with his background in jazz, rock, and Western art music to create a very unique, highly sought after style. In addition to being an original member of the SilkRoad Ensemble, he has performed with Bobby McFerrin, James Taylor, Aretha Franklin, Alison Krauss, and many others. Violinist and composer Shaw Pong Liuengages diverse communities with creative music and social dialogue. As one of three Artist-in-Residence with the City of Boston for 2016, Liu's current project, "Code Listen," explores how music can support healing and dialogue around challenging topics of gun violence, race, and law enforcement practices. She is a graduate of U.C. Berkeley with a Masters in Violin Performance from the New England Conservatory of Music. Special guest Lorraine Lee-Hammond has been playing and teaching the Appalachian dulcimer for over 30 years. In New England she is known as a virtuoso player as well as a fine songwriter whose music is infused with a rare combination of consummate skill and quiet joy, qualities that have become her trademark. When four young jazz virtuosos decided to join forces, The Rhythm Future Quartet was born. 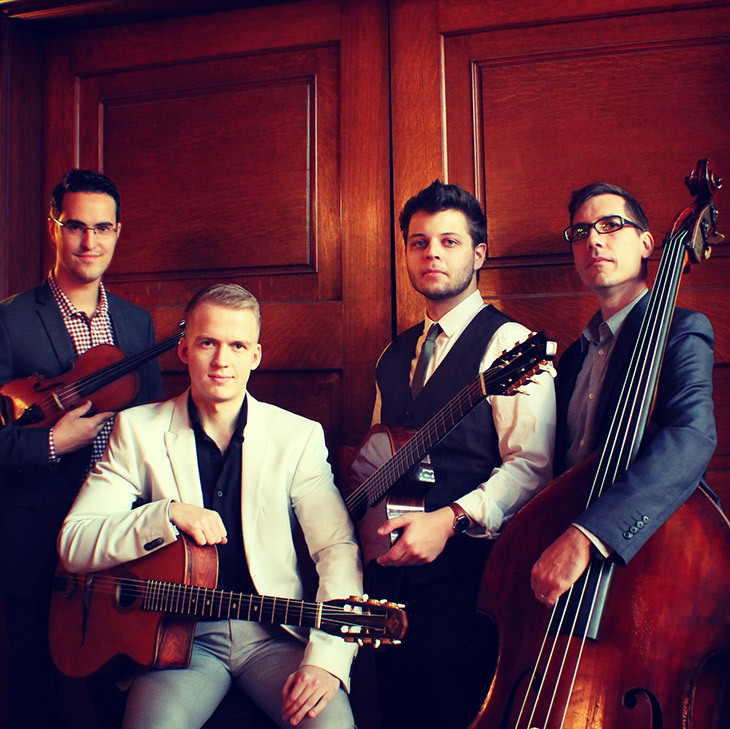 Named after a Django Reinhardt tune, The Rhythm Future Quartet performs dynamic and fiery arrangements of Gypsy jazz standards and original compositions that draw from rhythms heard around the world. Jason Anick and Olli Soikkeli, the front-men and lead soloists of the group, have been receiving critical acclaim this past year and are considered 'rising stars' in the world of jazz and Gypsy jazz. Soikkeli, who recently made the move from his home country of Finland to New York City, has rapidly become a top call guitarist in the bustling Brooklyn jazz scene and has been aptly coined "the Finnish boy wonder." Anick, who is also an award-winning composer, is one of the youngest professors at the esteemed Berklee College of Music in Boston. With Max O'Rourke on second guitar and Greg Loughman on bass, Rhythm Future is dedicated to expanding the boundaries of a vital musical genre. 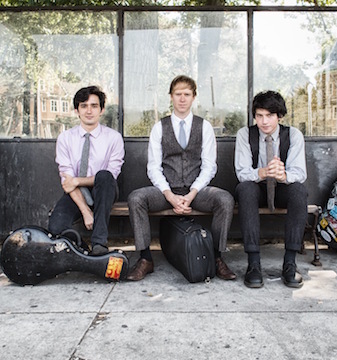 Where the band's self-titled debut album re-visited classic jazz and Gypsy jazz favorites, "Travels," the quartet's current release, concentrates on group originals that make captivating use of musical sources from outside the conventional Gypsy jazz terrain. "Travels" reflects both the accumulated knowledge garnered from the groups world wide touring as well as the international influences that inspired new rhythmic and harmonic possibilities within their compositions and arrangements. Garnering critical acclaim, "Travels" was picked as one of the Best Jazz Albums of 2016 by All About Jazz and the Huffington Post. Since its inception in 2006, the Matt Flinner Triohas been performing its own brand of acoustic music around the country to rave reviews. Mandolinist Matt Flinner, guitarist Ross Martin and bassist Eric Thorin cover a wide variety of musical styles - all with the common ground of originality. 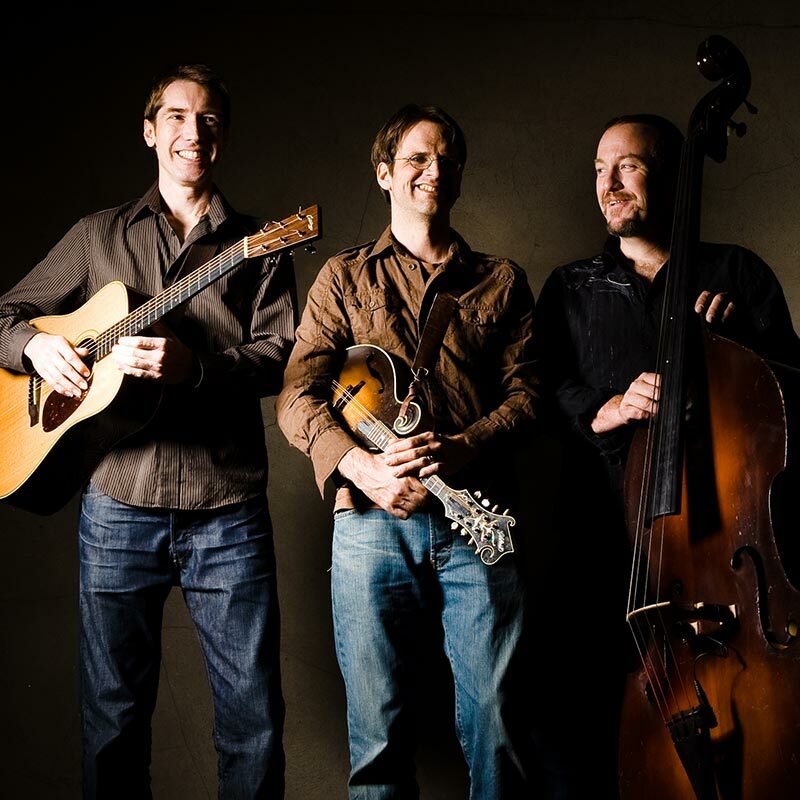 Bluegrass, jazz and old-time music are all present here in their ways, along with a dose of classical chamber music composition and arrangement, as the members all draw from their wide array of musical loves, experiences and influences. Call it Americana Music, or New Acoustic, or Chamber Grass, or just call it Great Music ... whatever label you put on it, it is guaranteed to be fresh and original, and definitely something you've never quite heard before. All master composers and improvisers, the trio has become legendary for their ability to almost simultaneous compose and perform new music. Their past two albums have developed this "music du jour" concept-drawing on whatever inspires them that day to compose a new tune and then performing it that evening. Their collective ability to conjure great melodies out of the ether and deliver them in front of a live audience has earned the group a reputation as one of the most imaginative and fearless in the contemporary instrumental space. Starting out as a banjo prodigy who was playing bluegrass festivals before he entered his teens, Flinner later took up the mandolin, won the National Banjo Competition in Winfield, KS in 1990, and won the mandolin award there the following year. He was featured on Steve Martin's CD "The Crow," which won the 2009 Grammy Award for Best Bluegrass Album. The trio's newest CD, "Traveling Roots," was released in 2016 on Compass Records to rave reviews. Special guest Bruce Molsky is one of the most revered ambassadors for America's old-time mountain music. For decades, he's been a globetrotting performer, ethnomusicologist and educator, a recording artist with seven solo albums, well over a dozen collaborations and two Grammy nominations. He's also the classic "musician's musician" - a man who's received high praise from diverse fans and collaborators like Linda Ronstadt, Mark Knopfler, Celtic giants Donal Lunny and Andy Irvine, and dobro master Jerry Douglas. This show postponed due to snow storm. Innovation combined with tradition: that's a hallmark of Clancy family musicians, and it's one that guitarist Dónal Clancy is carrying forward into the twenty first century. The acoustic guitar adds many colors and textures to Irish music, but there's no long history of it in Celtic tradition, as there is with the fiddle and the accordion. Dónal Clancy is one who's bringing the guitar forward to its rightful place as a strong part of Irish tradition. He's been involved with the best bands in Irish music, starting out in Clancy, O'Connell, and Clancy with his father Liam and his cousin Robbie O'Connell, helping to found the band Danu and then moving on to become part of Eileen Ivers Band before taking a pivotal spot playing guitar with one of the hottest Irish and Irish American bands around, Solas. When it was time to make a change, he found his old band Danu in need of a guitar player again, and that's still one of his main gigs. In 2014, to much critical acclaim, he released an album dedicated to The Clancy Brothers and Tommy Makem entitled "Songs of a Roving Blade." The Irish Post called it "folk singing at its best" and "a smashing album that should help to ensure these songs will never be lost." 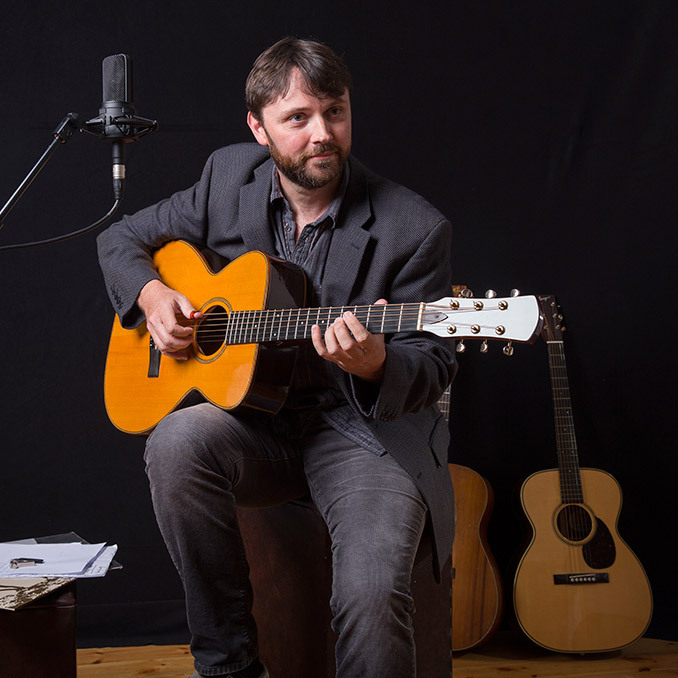 Dónal's latest album "On the Lonesome Plain" features a mix of seven vocal tracks and six guitar instrumentals, including two of his own compositions A Strike for Victory commemorating the 1916 Easter Rising and an instrumental piece entitled Máirseáil na Conrach,inspired by the dramatic beauty of West Kerry. Don't miss the Blackstone River Theatre debut of an incredible guitarist and powerful singer! Armand Aromin and Benedict Gagliardiare musically bound by a shared love of traditional Irish music, which originally brought them together, as well as an eclectic and ever-growing amalgam of songs both inside and far outside the realm of folk music. Combining Armand's multifaceted fiddle playing, Ben's self-developed concertina style, and a pair of complementary voices, The Vox Hunterspresent an exciting repertoire of driving dance tunes blended with an unorthodox collection of interesting songs. 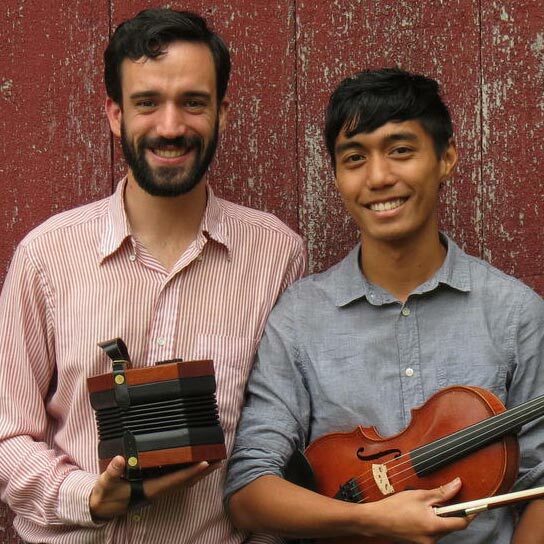 Aromin is a violin maker and musician based in Providence. He has studied at Berklee College of Music and the University of Limerick, and is a graduate of the North Bennet Street School in Boston, Mass. where he earned his diploma in Violin Making and Repair. Gagliardi is from Connecticut and has played throughout the Northeast at festivals, house concerts, and coffeehouses. He placed first in the 2014 Mid-Atlantic Fleadh Senior Duets competition with Jon Warner as well as Senior Melodeon and Harmonica. 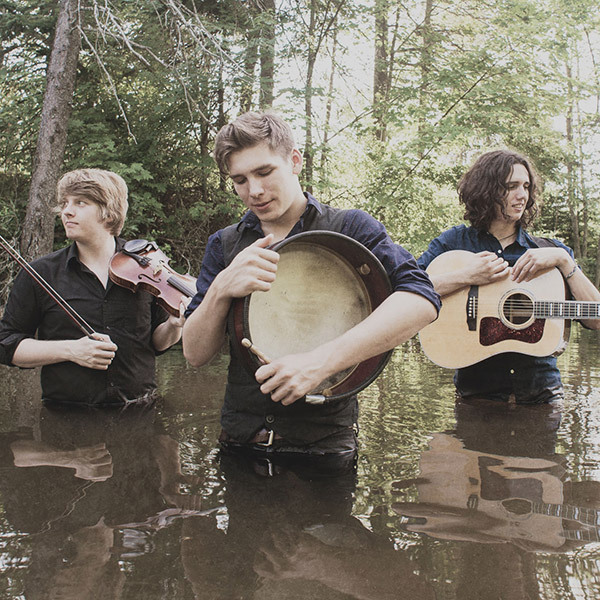 Fiddler Laurel Martin, Mark Roberts on flute, banjo, and bouzouki, and Kieran Jordan, who performs percussive sean-nós ("old style") step dance present traditional Irish music and dance with sweet melodies and the heartiest of grooves. 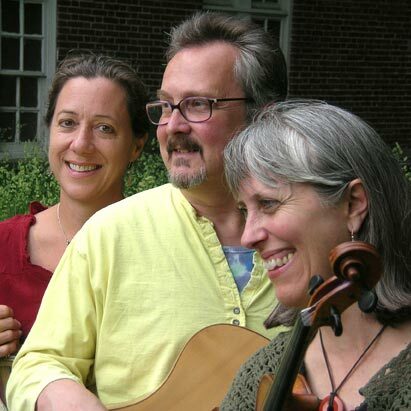 As long-time friends through music, these three artists have collaborated previously in other groups, and they have toured and performed together as part of the fiddle ensemble, Childsplay. As a trio, they present tasteful musical selections, with dance woven in as rhythmic and visual accompaniment. Performing with lyricism and consummate skill, this group also sprinkles their concerts with heart-felt anecdotes promising an uplifting show of good tunes, good steps, and good spirits. 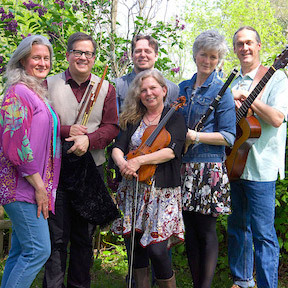 Mist Covered Mountains makes their Blackstone River Theatre debut with a concert of Celtic music with a French accent. Molly Hebert-Wilson sings in Irish and English and plays upright bass. Guitarist Max Cohen and fiddler Donna Hébert harmonize, with Alex Bell on bodhran and Molly on upright bass. Blurring lines between past and present, Mist Covered Mountains delivers ballads in English, Irish and French supported with dynamic instrumentals from traditional and original sources. Blackstone River Theatre audiences will be familiar with Donna Hébert from her appearances with Chanterelle. She is a Massachusetts Artists' Fellow in the Folk Arts. A singer, writer and composer as well as a fiddler, Donna has two original songs on Smithsonian recordings and directs the house contradance band at Philly Folk Fest. She also directs youth performances at Old Songs and Philadelphia Folk Festivals. Molly Hebert-Wilson's nuanced vocals in English and Irish render emotions in either language. An NYU theater and Irish studies grad, she grew up with traditional music. On stage from age 9, it was obvious that Molly would stay there but it was a welcome surprise that mother and daughter wound up together. Molly's recently added the upright and electric bass to her performances. Max Cohen's sparkling guitar supports Molly's nuance with his own, adding deft, humorous lyrics and his rich baritone. Max also tours with singer Priscilla Herdman and produces and engineers CDs for his colleagues. Alex Bell joined the band in 2014 on drums and bodhran. 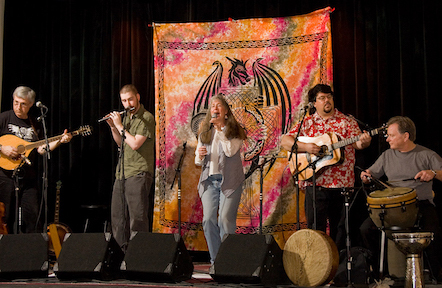 Irish vocalist Karan Casey was a founding member of traditional supergroup Solas, a band known for rousing tunes and striking renditions of traditional songs. 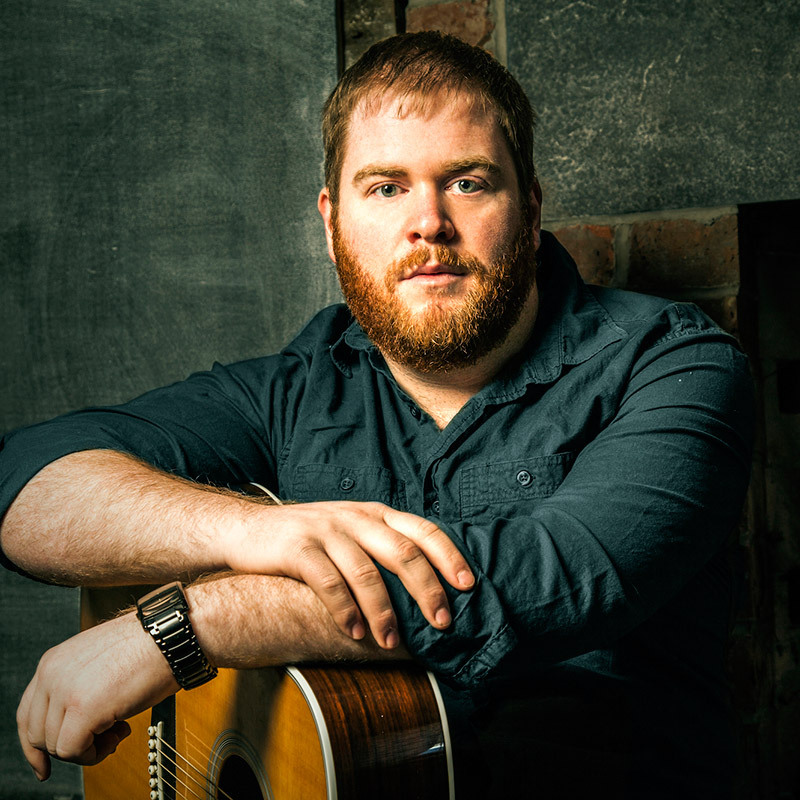 Since Solas, Casey has carved out a unique and acclaimed place in contemporary Irish and folk music. Karan has recorded six solo albums, has won Best Irish Female Vocalist twice, Best Irish Folk album and a Grammy for her collaboration with Paul Winter. She has been nominated for the BBC Folk Awards and has performed with Peggy Seeger, Liam Clancy, James Taylor, and Tim O'Brien. USA Today has called her work "shiver-inducingly excellent." 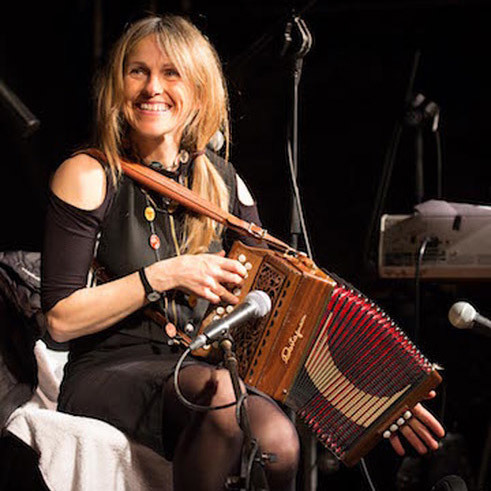 Sharon Shannon has been a musical icon for over 20 years. Traditional Irish music is her background but she has been fearless in her musical exploration having defied genres and woven her unique style through country, French-Canadian reggae, hip-hop, classical, and with her upcoming CD, "Sacred Earth" - African music. She is a former member of seminal Scots-Irish band The Waterboys, has achieved legendary status throughout the world, and has made the much maligned accordion 'cool' in her home country and abroad. At various times, Sharon has collaborated, toured and recorded with Bono and Adam from U2, Steve Earle, Jackson Browne, Willie Nelson, John Prine, and Christy Moore. Several of her albums have been platinum selling and she has had Number 1 albums and singles including the Steve Earle-penned "The Galway Girl" performed with Mundy, which was featured in the Hillary Swank movie "PS I Love You." Téada (pronounced Tay-da, meaning "strings" in Irish) return to the States after a nearly 5-year absence with Méabh Begley, a gifted singer from a famous musical family in West Kerry, and champion step-dancer Samantha Harvey. What sets Téada apart from many Irish bands is their passion for a deeply traditional approach. 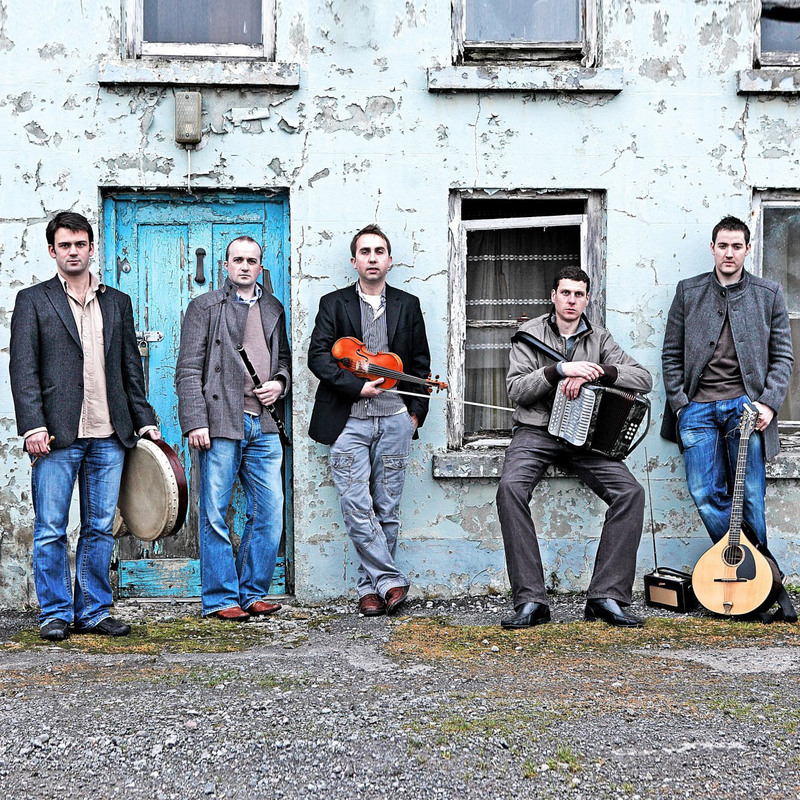 The young group has been heralded for their "fierce familiarity with the old ways" by Irish Music Magazine. Following an initial gig opening for the Sharon Shannon band at Dublin's Celtic Flame festival in 2001, Téada was off and running. They were quickly tipped as "one of the most exciting traditional groups in recent years" by The Irish World and voted "Best Traditional Newcomers" by readers of Irish Music Magazine in 2003. Fiddler Oisin Mac Diarmada is joined by fellow Sligoman Damien Stenson on flute, Seán McElwain on banjo and bouzouki, and Tristan Rosenstock on bodhrán. Despite her youth, Méabh (pronounced Mayve) Begley is fast becoming one of the most respected singers in Ireland. With her crystal clear voice, she commands an audience tackling themes of love, emigration, and loss in both the English and Irish languages. In addition, she continues the family accordion tradition. Pendragon - Celebrate St. Patrick's Day! New England has long had a rich tradition of Celtic-inspired music. For 33 years, Pendragon has embraced that tradition and created a timeless sound of its own, performing roots music with an unmistakable contemporary edge. Pendragon is award-winning step dancer and percussionist Kevin Doyle, Bob Drouin on fiddle, bouzouki and tenor banjo, Russell Gusetti on guitar and concertina, Josh Kane on flute and whistles, and vocalist Mary Lee Partington. 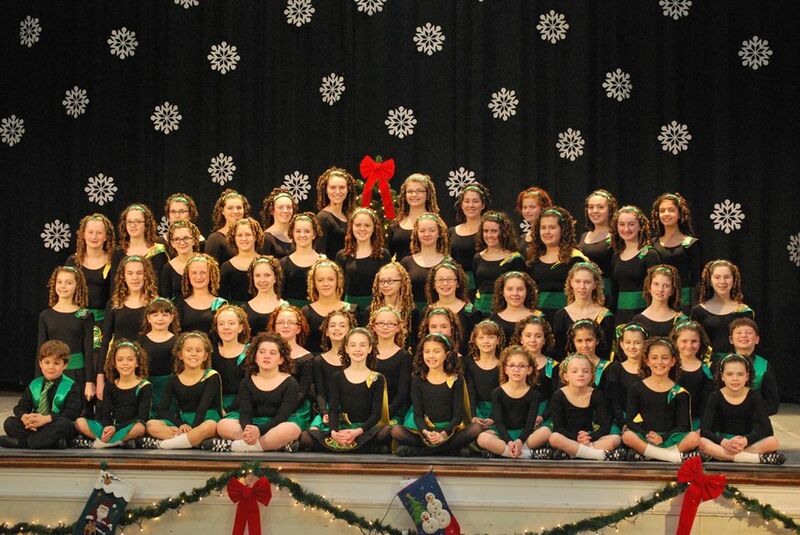 They will be joined tonight by guest step dancer Erika Damiani and All-Ireland uileann piper Torrin Ryan. Pendragon's music celebrates the lives and lore of generations of New Englanders who brought traditions from Ireland, Scotland, French Canada and other distant shores to the banks of the Blackstone River. 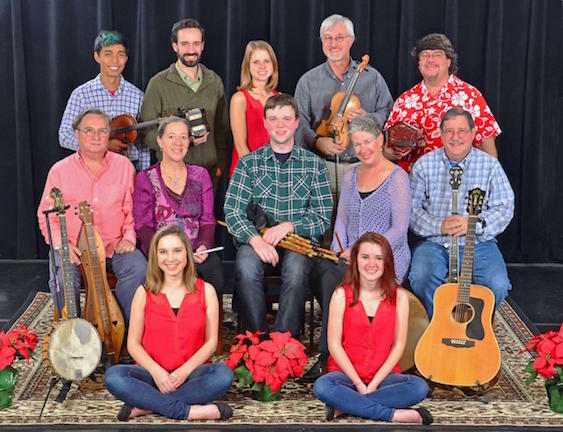 The band performs their original songs and dance tunes on an exciting combination of fiddle, flute, bouzouki, concertina, banjo, guitar, whistle, and percussion. In performance, Pendragon elaborates on the cultural and historical context of their music while projecting a relaxed and humorous stage presence. Pendragon has been voted Rhode Island's Best Celtic Act nine times in the Motif Magazine's Best Music Awards. The band released a 30th Anniversary CD, "Live at Blackstone River Theatre" in 2014. 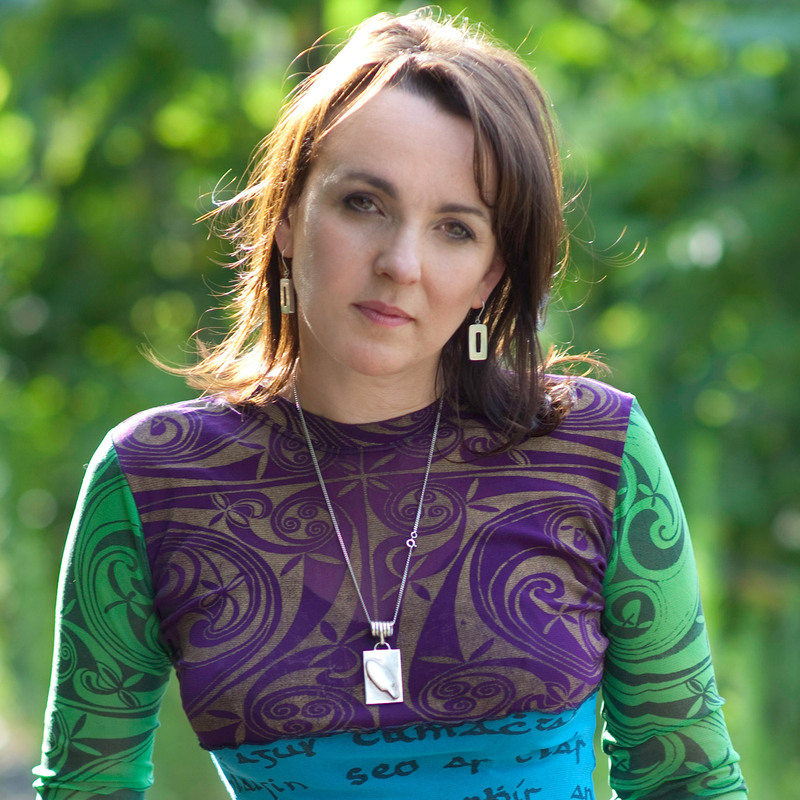 As traditional Irish music continues to enjoy phenomenal success both here and in Ireland, Áine Minogue (pronounced On-ya) is an artist who has long explored its themes and who captures its very essence. Her ethereal singing reflects the lyricism and richness to be found in Irish music, mythology and poetry with a voice undeniably her own. 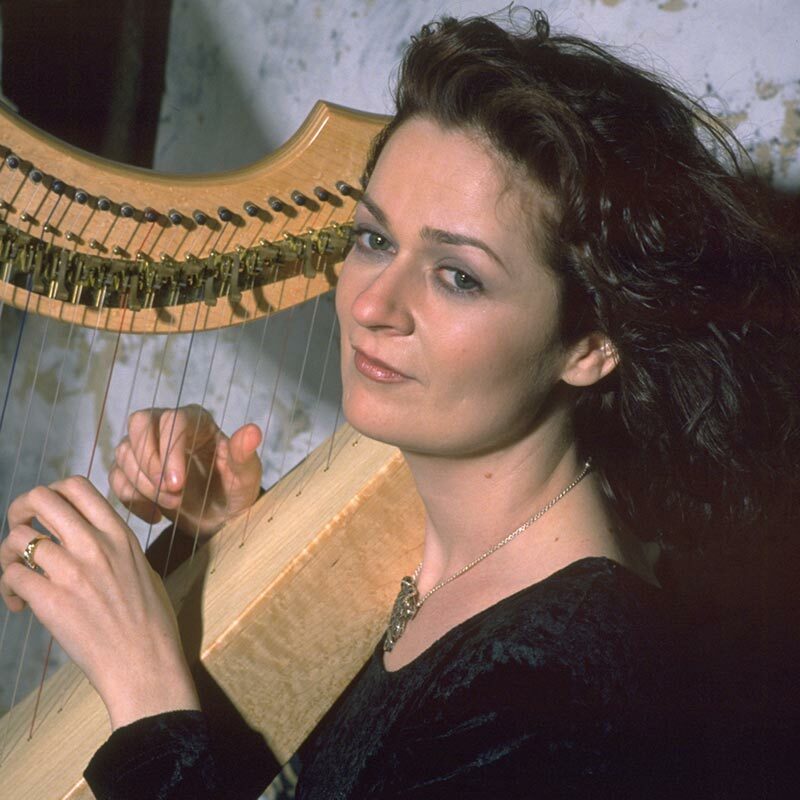 Born in County Tipperary, Áine's family encouraged her to pursue a number of instruments but it was at age 12 that Áine discovered her true love - the harp - which she decided to pursue in lieu of the others. Áine takes this ancient art form, exploring its underpinnings but adding her own creativity to each piece. With a combination of harping, singing and storytelling with a touch of poetry, her concerts have an intimate "getting away from it all" feel. In this special concert, Minogue celebrates the symbolism of Spring in Ireland and the Celtic lands - Ireland, Wales, Scotland and Brittany. This Pan-Celtic odyssey is an enchanting evening of music, storytelling, and tradition that is appropriate for all ages and designed to "Welcome in the Spring." Minogue, an expert in the area of Irish traditions, has done extensive research into the Celtic wheel of the year traditions, including the Spring Equinox, and has unearthed some unusual and haunting selections from Scotland, Wales, Cornwall, the Isle of Man, and Ireland. Aine's recordings include "The Twilight Realm," "The Mysts of Time," "Between the Worlds," "Celtic Meditation Music," "Celtic Pilgrimage" and her latest, "Close Your Eyes, Love. Numerous tracks of her music appear on compilations for such labels as BMG, Virgin, Rounder, and Putumayo in varying styles including Celtic, world, folk and new age. Her music videos have been aired on PBS's "Out of Ireland" and she has provided solo instrumental harp music for a number of soundtracks. Seeing a Spuyten Duyvil (pronounced SPITEen DIEvul) show for the first time has been described as "like throwing a cherry bomb into a lake ... It wakes you up." Dating back to the 17th century, the name Spuyten Duyvil originates from the Dutch settlers who gave the name to a creek that flowed around what is today the Marble Hill neighborhood in the Bronx. The New York band's brand of original and traditional American roots music blends old time, blues, bluegrass, and folk rock with a pinch of punk energy to create a uniquely modern mix. 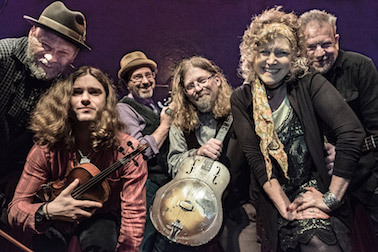 Led by songwriting couple Mark Miller and Beth Kaufman, this six-piece powerhouse has been bringing barn-burning energy to venues throughout the Northeast and Midwest. It's an exciting time for the Hudson Valley-based band. Their 3rd CD, "The Social Music Hour Vol 1," features essential traditional songs popularized by Mississippi John Hurt, Elizabeth Cotten, Big Bill Broonzy, Woody Guthrie, Lead Belly and more, 'arranged by the band for today's listener.' The CD received a 2016 International Folk Music Awards "Album Of The Year" Nomination. Familiar, forgotten words find new meaning in this historically informed but thoroughly contemporary treatment of re-imagined American roots music. The group features Beth Kaufman on vocals, Jim Miegs on harmonica, Lou Geser on drums, John Neidhart on bass, Jeremy Aaron on guitar, and Mark Miller on tenor guitar and vocals. Tonight's special show features Duke Robillard on guitar and vocals joined by his band - Bruce Bears on piano, Brad Hallen on bass, Mark Teixeira on drums, plus two additional members - the wonderful Sunny Crownover singing and swinging plus the incredible Billy Novick on alto sax, clarinet and an occasional jazz penny whistle. The material is basically '20s and '30s tunes both well known and obscure, blues, and a few cool vintage Latin tunes thrown in for good measure. The blues tunes are of real vintage variety from the 20s to the 40s as well as swinging instrumentals that feature the brilliant virtuosity of the boys in the band. This show coincides with last weekend to view Duke's art exhibition at Blackstone River Theatre. Age-old entertainments - sitting around the fire, telling tales - can take on ever-new faces. Young acoustic power trio Ten Strings and a Goat Skin from Canada's Prince Edward Isle know this, transforming tradition with vigor, curiosity, and sparks of goofy humor. Hailed on two continents as "infectious" and "the best of contemporary/trad Celtic music" Ten Strings And A Goat Skin are a bilingual trad/folk/fusion trio, playing Irish, Acadian, French and original creations infused with modern and world rhythms. Percussionist Caleb Gallant, fiddler Rowen Gallant, and guitarist Jesse Périard are pushing boundaries and reinvigorating timeless traditional music for the 21st century. Ten Strings and a Goat Skin have received more Canadian Folk Music Award 2016 nominations than any other band in the country. The group is nominated in three categories and member Rowen Gallant is up for best traditional singer of 2016. The band is inviting a new circle of listeners with their newest CD, "Auprès du Poêle" ("around the woodstove") for sometimes moody, sometimes high-energy sets of original and traditional songs. Expanding on the Scottish and Acadian roots of PEI's traditional music, Ten Strings and a Goatskin weave old-school Franco-Canadian, Breton, Irish, and Scottish tunes with wickedly current grooves and clever quirks, flirting with indie's best moments. Don't miss their Blackstone River Theatre debut! Hanneke Cassel, Mike Block and Keith Murphy - CD Release! Effervescent and engaging, Boston-based fiddler Hanneke Cassel is a performer, teacher and composer whose career spans over two decades. Her style fuses influences from Scotland and Cape Breton Island with Americana grooves and musical innovations, creating a cutting-edge acoustic sound that retains the integrity and spirit of the Scottish tradition. Cassel’s music is a blend of the contemporary and traditional, described by the Boston Globe as “exuberant and rhythmic, somehow wild and innocent, delivered with captivating melodic clarity and an irresistible playfulness.” Cassel’s latest release, "Trip to Walden Pond," features traditional Scottish and Cape Breton tunes and seventeen new pieces composed in the Scottish idiom. While her lively style is very much evident, this new album carries a deep, soulful sound with songs of celebration and farewell. "Trip to Walden Pond," similar to Cassel's five previous albums, offers arrangements of traditional fiddle music and original tunes that evoke humor and heart. This latest album also includes several compositions penned by Hanneke as commissions to benefit Many Hopes, a children’ s education nonprofit based in Kenya that she avidly supports. A native of Oregon, Hanneke started out as a Texas-style fiddler and went on to win the 1997 U.S. National Scottish Fiddle Championship, which awarded her the opportunity to study with Alasdair Fraser and introduced her to fiddle camps and the folk community – both of which continue to play an integral role in her life. The Hanneke Cassel Band features Mike Block on cello and guitarist/vocalist Keith Murphy. 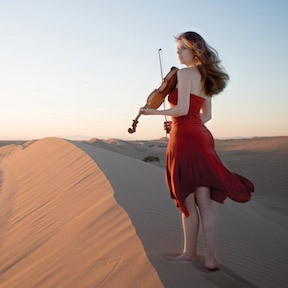 In addition to performing with her own band, Cassel has been featured on PBS with Boston-based fiddle band Childsplay and has performed with Baroque/Celtic group Ensemble Galilei at the Metropolitan Museum of Art in New York and the National Geographic in Washington, D.C. Hanneke and her husband Mike live in Boston and are active within many circles of musicians. 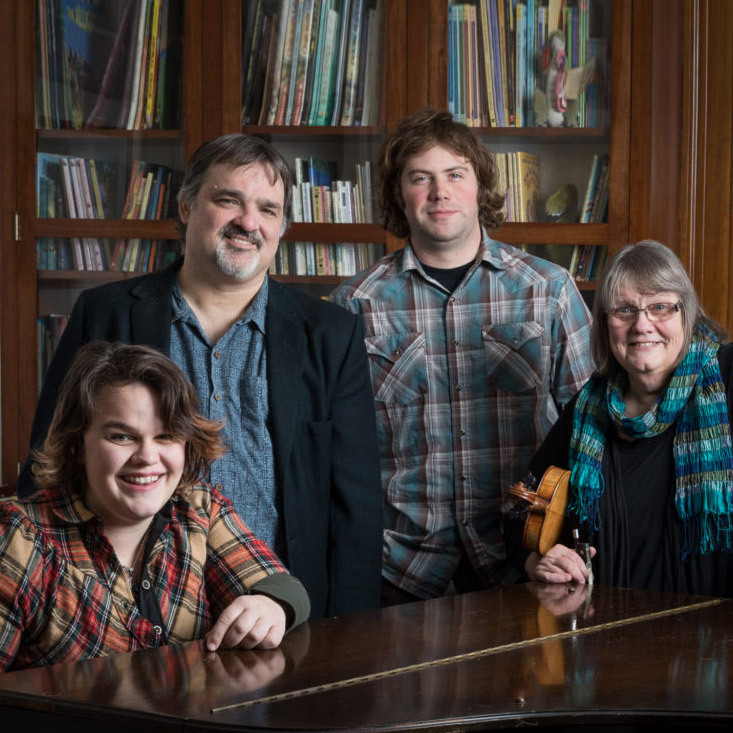 Besides their involvement in the Scottish fiddle scene and at Berklee College of Music, they are frequent performers at Club Passim and are rooted in the thriving local music community. BRT will present American roots artist Grant Maloy Smith releasing his new CD, "Dust Bowl – American Stories," during a special Earth Day concert featuring an opening set by Eastern Medicine Singers who perform Algonquin and Native American drumming and song. 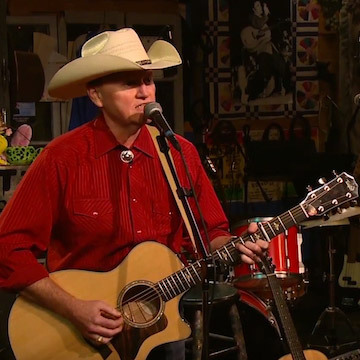 Grant Maloy Smith is a singer/songwriter of American Roots music - a blend of old country, bluegrass, folk and Celtic influences into a uniquely American genre. “Earth Day is especially significant, because the Dust Bowl of the 1930s was the biggest environmental disaster in centuries. It’s a cautionary tale about the environment,” says Smith. Songs from the album will be performed by Smith accompanied by Cathy Clasper-Torch on fiddle, Richard Ribb on bass, and Rick Couto on drums. There will be a video introduction on a large projection screen that sets up the stories of the Dust Bowl, and brings the audience back in time to the Great Plains of the 1930s, when it didn’t rain for most of the decade, and millions of Americans became essentially refugees in their own country. “The Dust Bowl caused American Roots music to be spread far and wide, and troubadours like Woody Guthrie sang about it, making it well known to the rest of the nation and the world,” says Smith. The CD was recorded over a three-year period of research, writing, and recording, from New York to Nashville, and from Rhode Island to Oklahoma and even Australia. Basic tracks were recorded in New York, and feature several members of Cyndi Lauper’s band, including bassist and musical director Bill Wittman, and drummer Skoota Warner. Then production moved to Nashville, where a who’s who of A-list players played on the album, including dobro player Rob Ickes, and steel players Mike Johnson and Troy Klontz. Additional performances were added by Native American flutist Gareth Laffely, who played a heartfelt solo on "Ihst a Lhampko" (Have Strength), a song told from the point of view of the Choctaw Nation, the first of the 5 tribes marched out of their homeland during the Trail of Tears. “That’s not even the whole list of musicians that I am fortunate to have on the album,” said the songwriter. “We recorded additional parts in Rhode Island and New Bedford. Parts were recorded in eight studios on two continents. It was the biggest project I’ve ever done.” The album is already getting great reviews from publications. Smith was recently interviewed in the Huffington Post in a piece about his music and advocacy in the world of independent musicians. “The environment has never been more important – we can learn a lot from the Dust Bowl. Reliving it through these songs and images is a powerful elixir,” says Smith. The Tannahill Weavers are one of Scotland's premier traditional bands. 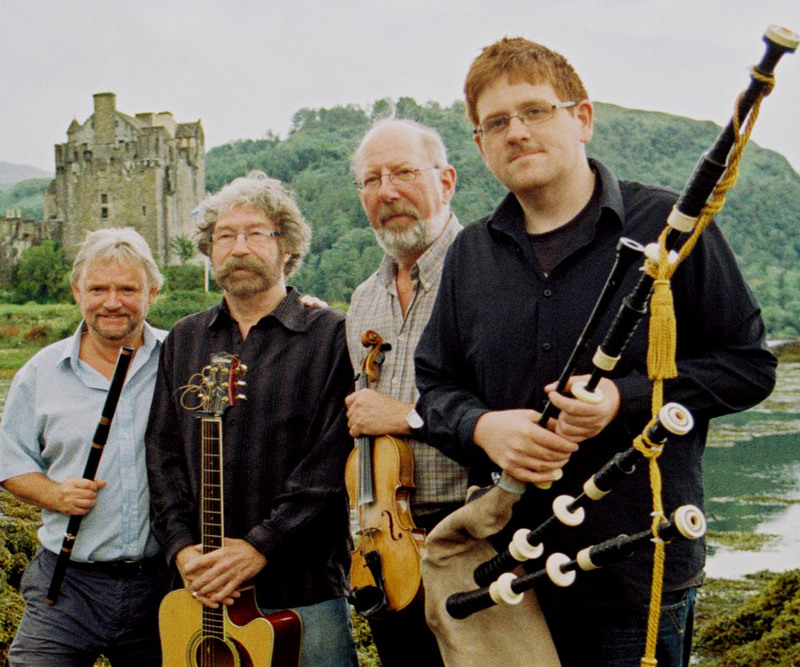 Their diverse repertoire spans the centuries with fire-driven instrumentals, topical songs, and original ballads and lullabies demonstrating to old and young alike the rich and varied musical heritage of the Celtic people. These versatile musicians have received worldwide accolades consistently over the years for their exuberant performances and outstanding recording efforts that seemingly can't get better... yet continue to do just that. The Tannies have turned their acoustic excitement loose on audiences with an electrifying effect. Says The Boston Globe, "Scotland's Tannahill Weavers play acoustic instruments, but the atmosphere at their shows is electric. 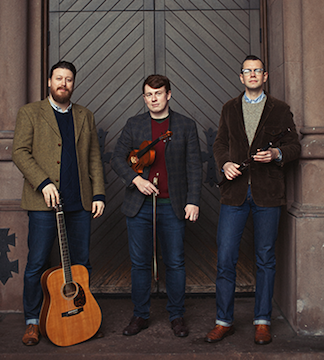 The quartet is as tight and as versatile as any band in the Celtic music revival. They can summon rock 'n' roll intensity or haunting introspection." Born of a session in Paisley, Scotland, and named for the town's historic weaving industry and local poet laureate Robert Tannahill, the group has made an international name for its special brand of Scottish music, blending the beauty of traditional melodies with the power of modern rhythms. Members are Roy Gullane on vocals and guitar, John Martin on fiddle and vocals, Phil Smille on flute, whistles and bodhran, and newest member Lorne McDougall, three times BBC Radio Scotland Young Traditional Musician of the year finalist. BRT favorites Aubrey Atwater and Elwood Donnelly return with Cathy Clasper-Torch on fiddle, cello and vocals to present an engaging concert of traditional American and Celtic American folk songs, a cappella pieces, hymns, poetry, dance tunes, and original works. 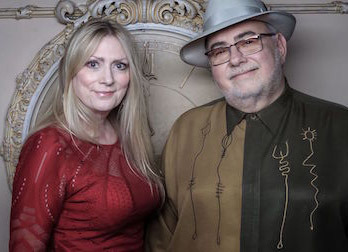 Elwood and Aubrey blend unusual harmonies and play guitar, Appalachian mountain dulcimer, Irish tin whistle, harmonica, old-time banjo, bones, limberjacks and other musical surprises. Their performance is appealing to all ages, and with humor, audience participation and a highly-relaxed stage presence, Aubrey and Elwood also explain song origins to give more relevance to the material. Atwater-Donnelly performs widely in the Northeast and other parts of the United States and Great Britain and their recordings receive international airplay. They have performed and researched folk music extensively in New England, Ireland, England, Prince Edward Island, the Ozarks, and Appalachia. Clasper-Torch plays regularly with The Gnomes and is the fiddle instructor at Blackstone River Theatre. 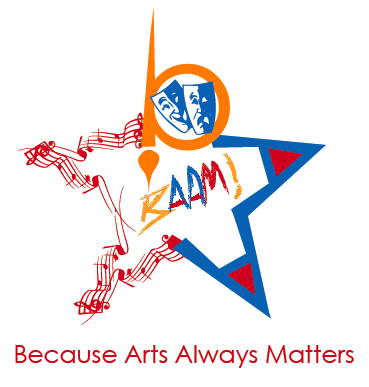 The mission of BAAM (Because Arts Always Matters) is: To nurture and support the fine and performing arts experience for Cumberland students and to promote citizen support for an enriched fine and performing arts program in Cumberland. Today's free event will feature: Live Art Demonstrations • Children’s Art contest • Hunting for the Creative Side of Cumberland contest (Winners announced day of the event) • Art work and refreshments available for purchase • Blackstone River Theatre • Cumberland Artist Alliance • Rick’s Musical Instruments • Office of Children, Youth and Learning • Boldacious Creations and more! 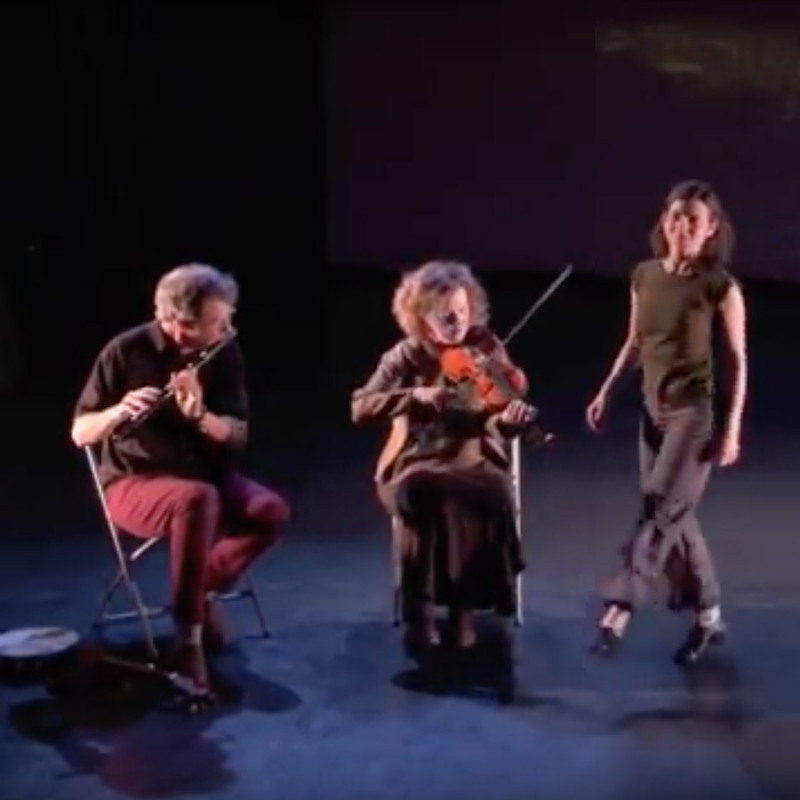 Members of Pendragon, members of Tir Na Nog Irish Dance, members of The Broad Street Fiddlers will perform to showcase classes and concerts held at Blackstone River Theatre. There will also be performances by Scott Walmsley. Matthew Byrne’s live performance explores his unique Newfoundland musical lineage with thoughtful and honest interpretations of traditional songs from both sides of the Atlantic. These songs are delivered with polished guitar work, powerful vocals, and masterful storytelling. Says Brian O'Donovan, WGBH Boston, “It’s increasingly rare to find male traditional singers who are not just good, but GREAT! Matthew is certainly in that truly great category.” Indeed, "Hearts & Heroes" won “Traditional Album of the Year” at the 2015 Canadian Folk Music Awards. Byrne was born into a family of Newfoundland music makers and his repertoire draws heavily from songs he has ‘inherited’ as a result. His tradition thrives on the song – the weaving of a great story with a beautiful melody – and his music reminds us how satisfying they can be when stripped down to these basic elements. Since bursting on to the trad scene in 2010 with his debut recording, "Ballads," Matthew has swiftly earned his place as one of Canada’s most authentic and vital traditional singers. In that time his music has traveled well beyond the rugged shores of his Newfoundland home. Byrne’s role as singer in The Dardanelles has also brought him to major international festival stages in North America, the UK, and Australia. 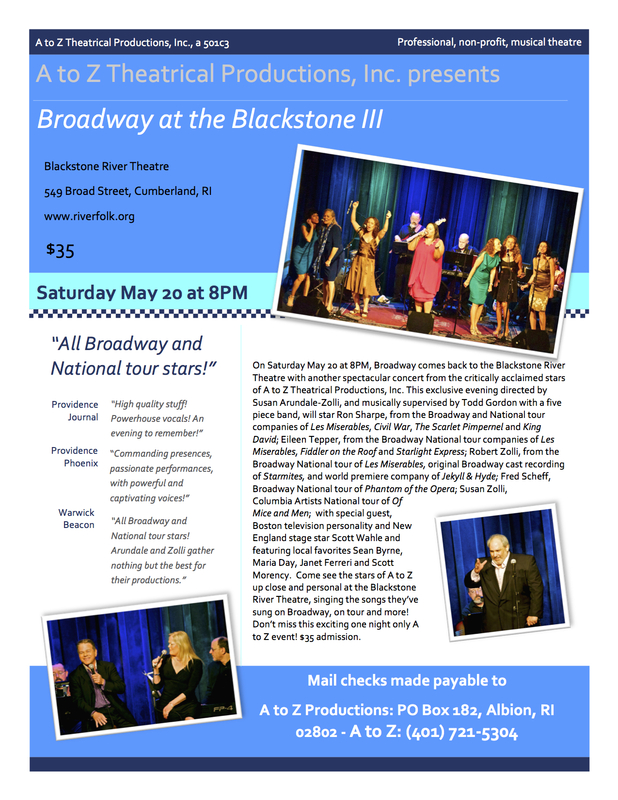 Broadway comes back to the Blackstone River Theatre with another spectacular concert from the critically acclaimed stars of A to Z Theatrical Productions, Inc. This exclusive evening directed by Susan Arundale-Zolli, and musically supervised by Todd Gordon with a five piece band, will star Ron Sharpe, from the Broadway and National tour companies of Les Miserables, Civil War, The Scarlet Pimpernel and King David; Eileen Tepper, from the Broadway National tour companies of Les Miserables, Fiddler on the Roof and Starlight Express; Robert Zolli, from the Broadway National tour of Les Miserables, original Broadway cast recording of Starmites, and world premiere company of Jekyll & Hyde; Fred Scheff, Broadway National tour of Phantom of the Opera; and Susan Zolli, Columbia Artists National tour of Of Mice and Men; with special guest, Boston television personality and New England stage star Scott Wahle. Also featuring local favorites Sean Byrne, Maria Day, Janet Ferreri and Scott Morency. Come see the stars of A to Z up close and personal at the Blackstone River Theatre, singing the songs they’ve sung on Broadway, on tour and more! 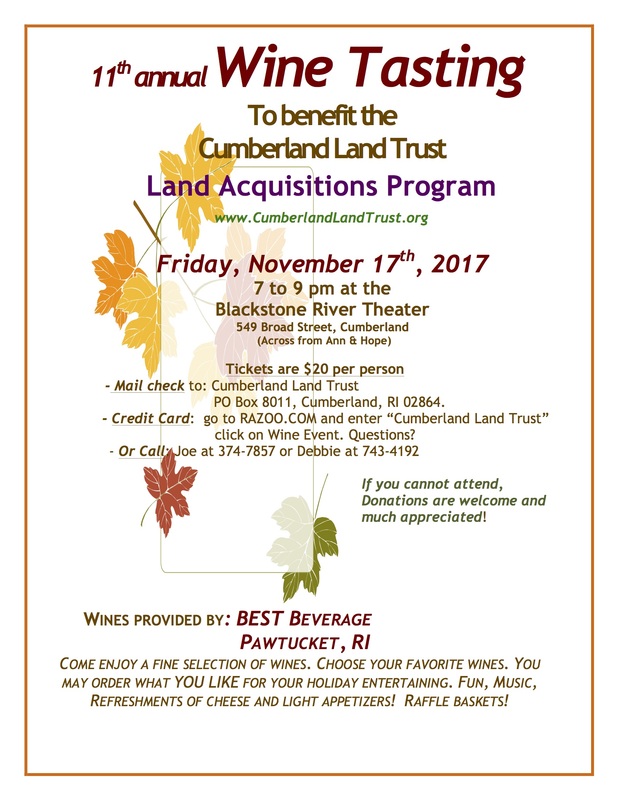 Blackstone River Theatre is excited to offer our stage to the Cumberland High School Clef Singers for their annual Senior Showcase! The Johnson Girls have been a force on the folk and maritime music scene for almost two decades as the leading all-woman, a cappella maritime group in the world. Having burst through the barrier of this previously male dominated genre, Joy Bennett, Alison Kelley, Bonnie Milner, and Deirdre Murtha each bring a special influence to the group. Whether performing at packed international folk festivals, intimate venues, or presenting school and library programs, The Johnson Girls remain true to their mission of keeping chantey singing alive, bringing women’s voices to the fore, and encouraging everyone to join in the revelry. The Johnson Girls have performed at major festivals, clubs, coffeehouses, schools, and more across the United States, in Canada, England, Wales, Ireland, the Netherlands, Portugal, and France. Widely acclaimed for their powerhouse performances of rousing work songs, sensitive renderings of haunting ballads and laments, and hair-raising harmonies, The Johnson Girls sweep their audiences along in a tidal fervor. Join us as we kick off our season with a great night of singing! Unlike most folk artists who look to far off places for the inspiration behind their music, Rhode Island songwriter Jon Campbell writes from a strong sense of place. His music reflects on the uniqueness of life in coastal New England, and is brought forth from his personal experience and great familiarity with his subject matter. At times humorous, at times poignant, these songs are a glimpse into life as it is lived where the sea and land meet. Increasingly, his material is being performed and recorded by singers from Cape Cod to Cape Disappointment, and beyond to Ireland, and he himself has taken these songs to stages as far away as Alaska. 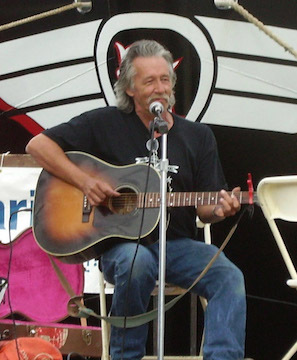 Jon has been a recognized Rhode Island State Council on the Arts Folk Artist since 1982, and he has been involved in a large number of recording projects both as performer and producer. 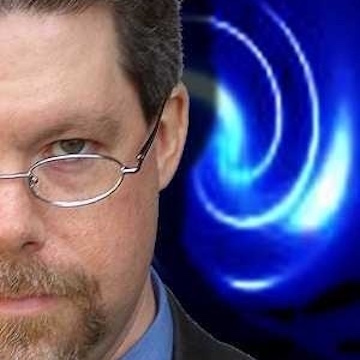 Rory Raven is a mentalist with 20 years of experience reading minds and astonishing audiences. Neither a psychic nor a magician, he offers a compelling kind of entertainment unlike anything audiences have ever seen. With a few simple props (paper and pencil, a pack of playing cards, some paperback books, and the thoughts of volunteers) Rory involves the audience in a highly unusual – and unusually entertaining – experience. Thoughts are revealed, predicitions come true, and perhaps even the spirits are summoned... FAQs: Okay, let's start with that title - what's a mentalist? A mentalist is a theatrical mind-reader... a performer who, using a variety of techniques, is able to produce results that would only seem possible by psychic or paranormal means. And those techniques would be...? They range from a knowledge of subtle psychological principles and the quirks of human behavior, to quick thinking and a good memory. Rory is also interested in things like suggestion, non-verbal communication, and the so-called trance state. And he doesn't hesitate to borrow ideas from the stage magician, either! So is he psychic or what? No. Not everyone believes him when he say that, but there's not much he can do about it. People who believe in the paranormal will believe no matter what he tells them, and those who don't believe won't believe no matter what he shows them. Always a great evening … why not see what YOU think! North Sea Gas is a folk band from Scotland who have been performing their blend of poignant and rousing songs and high-energy instrumentals for 35 years. 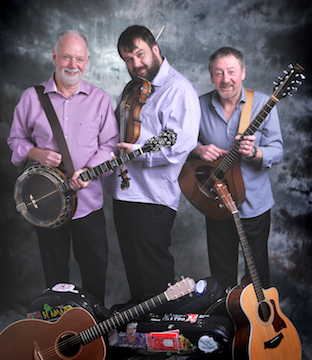 With a combination of fiddle, guitar, mandolin, bodhran and bouzouki, complementing strong three-part vocal harmonies and a keen sense of humor, an entertaining evening is always guaranteed. North Sea Gas has now recorded 19 albums and played to audiences all over Great Britain, Europe, Scandinavia, the U.S. and Canada. This marks their 13th appearance at BRT as they tour behind their newest CD, “When We Go Rolling Home." A previous project "The Fire And The Passion Of Scotland" won the 2013 Album of the Year award from Celtic Radio in the U.S. as well as first place in the "Jigs and Reels" category for a set of tunes on the album. The band is led by founder Dave Gilfillan on lead vocals, guitar and banjo, well-known for his tongue-in-cheek humor. Ronnie MacDonald on lead and harmony vocals, guitar and bouzouki is joined by Grant Simpson on high-energy fiddle and vocals. 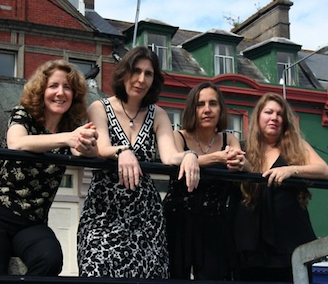 Skipper’s Alley are a modern Irish folk band with an old-school approach. Their influences range from folk revival bands such as Planxty and The Bothy Band to rare, experimental solo players like Tommie Potts and Séamus Ennis. Once described as "a young Irish ensemble who look like a punk band and sound like The Chieftains” Skipper’s Alley specialize in gritty, high-octane Irish dance tunes on uilleann pipes, whistles, fiddle, bodhrán, bouzouki, flute, and harp with occasional detours into the dark melodies of the Irish song tradition. Since forming in 2013 Skipper’s Alley have garnered wide critical praise, appeared on national and international TV, and toured on four continents. Write-ups include The Irish Times (★★★★), The Living Tradition, Folk Radio UK, Folk World, and Celtic Music Radio (★★★★★). In 2014, Skipper’s Alley’s released their acclaimed self-titled debut album under the production of Trevor Hutchinson (Lúnasa, The Waterboys). 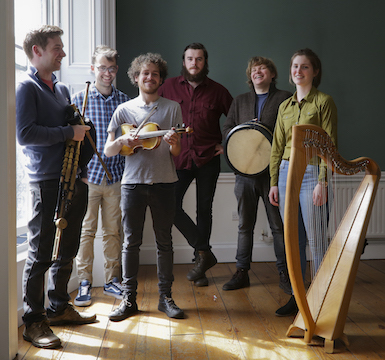 This exciting six-piece band from Dublin features Fionnán Mac Gabhann, Patrick Cummins, Macdara Yeates, Seán Gavin, John Flynn and Ultan O'Brien. Don’t miss their Rhode Island debut! 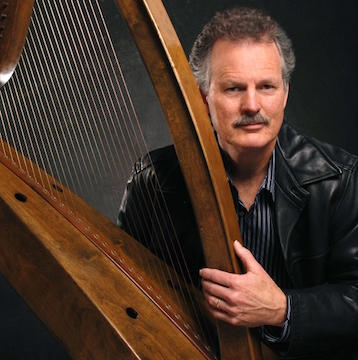 Patrick Ball, one of the premier Celtic harp players in the world and also a captivating spoken word artist, will present a harp-filled, dramatic performance based on the life and works of Ireland’s greatest poet, William Butler Yeats. In playing the ancient brass-strung harp of Ireland with its crystalline, bell-like voice, and in performing marvelous tales of wit and enchantment, Ball not only brings new life to two cherished traditions, but blends them to create a richly theatrical performance. Patrick Ball has recorded nine instrumental and three spoken word albums which have sold well over one-half million copies internationally and won national awards in both the music and spoken word categories. Ball has been awarded grants for his work by the California Arts Council and is the recipient of the Circle of Excellence Award from the National Storytelling Association. Whether in the stronghold of a Galway chieftain in the years before history began or yesterday in the snug corner of a pub in Dublin, the Irish have always delighted in storytelling. Their passion for eloquence and wordplay, their deep devotion to their mythical past, their ability to find joy and humor in a dark world, and their belief that the supernatural world could appear between one breath and the next made their stories and the telling of them unrivaled in the world of the oral tradition. And always, amidst the storytelling, there was music. Jigs, reels and haunting airs graced the spaces between the tales. And first among Irish instruments, and the most honored, was the legendary Celtic harp. In "Come Dance With Me in Ireland: A Pilgrimage to Yeats Country" Patrick Ball rekindles the fire and wonder of an evening of Irish music and storytelling. The mission of keeping a rare musical flame alight is a noble and often challenging one, but the Bohemian Quartet is more than up to the task. 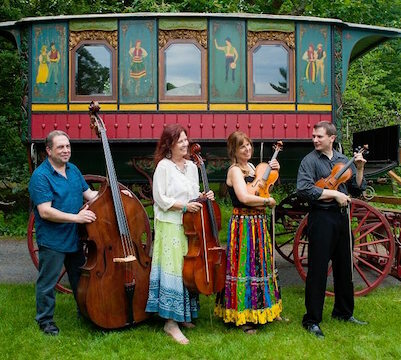 In this case, the acclaimed Rhode Island-based ensemble featuring violin, viola, cello, and bass specializes in music of the "Romani" or "Gypsy" tradition, along with related Eastern European folk styles. The Bohemian Quartet was formed in 2005. Violinist Stan Renard, a composer and virtuoso player with an impressive list of credentials, assembled the group with the idea of preserving the tradition and indulging in the virtuosic playing of classic gypsy music. Renard recruited like-minded and ambitious friends: Christine Harrington on cello, Nancy Richardson on viola, and Dave Zinno on upright bass. Together, they've made a commitment to the genre, and aspired to performing it with both reverence and adventure. Indeed, like every good curator, the ensemble embraces tradition, and still wanders off in newer, unpredictable directions. The name "Bohemian Quartet" was borrowed from the original Bohemian Quartet (also known as the Czech Quartet after 1918), a string quartet of international repute that was founded in 1891 and disbanded in 1934. Both groups share a passion for the deep-rooted authenticity of the Romani tradition, as well as the ability to play that historic repertoire with extraordinary joie de vivre. Tonight will be the CD release of their 3rd project called "For You." 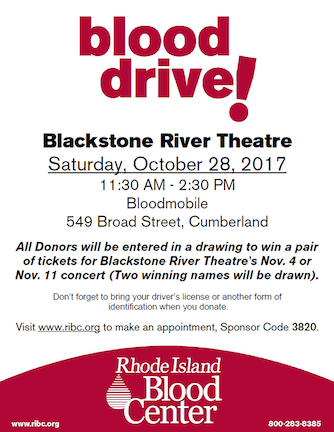 Blood Drive at Blackstone River Theatre! We hope you will stop by Blackstone River Theatre today between 11:30 a.m. and 2:30 p.m. as we host our first-ever BLOOD DRIVE when the Rhode Island Blood Center Bloodmobile parks outside of the theatre. As an incentive, all donors will be entered in a drawing to win a pair of tickets for BRT's concerts on Nov. 4 (The Gnomes) or Nov. 11 (Jeremy Kittel). Bring your driver's license or another form of ID when you donate. Thank so much for helping! 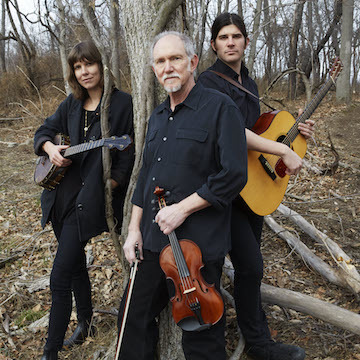 Bruce Molsky, “one of America’s premier fiddling talents” (Mother Jones) and a Grammy-nominated artist on fiddle, banjo, guitar and song is delighted to bring his new group, already on tour in the U.S., to Blackstone River Theatre. Bruce’s previous collaborations, with Anonymous 4, was released to rave reviews and was on the top 10 Billboard charts for weeks. He is also a special guest on legendary guitarist Mark Knopfler’s latest CD and is working on his 3rd album with Andy Irvine & Donal Lunny’s supergroup Mozaik. Molsky is also Berklee College of Music’s Visiting Scholar in the American Roots Program. Allison de Groot combines virtuosity with a passion for old-time music. With her own bands The Goodbye Girls and Oh My Darling, she has played Trafalgar Square in London, Newport Folk Festival, Stockholm Folk Festival and more. Like Bruce, Allison loves collaborating and bringing new ideas to old music, and brings a fresh approach to the trio. Boston-based Stash Wyslouch is one of bluegrass’ great young genre-bending pioneers. He got his start as a guitarist in metal bands before immersing himself in roots music as a member of The Deadly Gentlemen. Stash is a veteran festival performer, having played at Grey Fox Bluegrass Festival, Rockygrass, Merlefest, Savannah Music Festival and others. 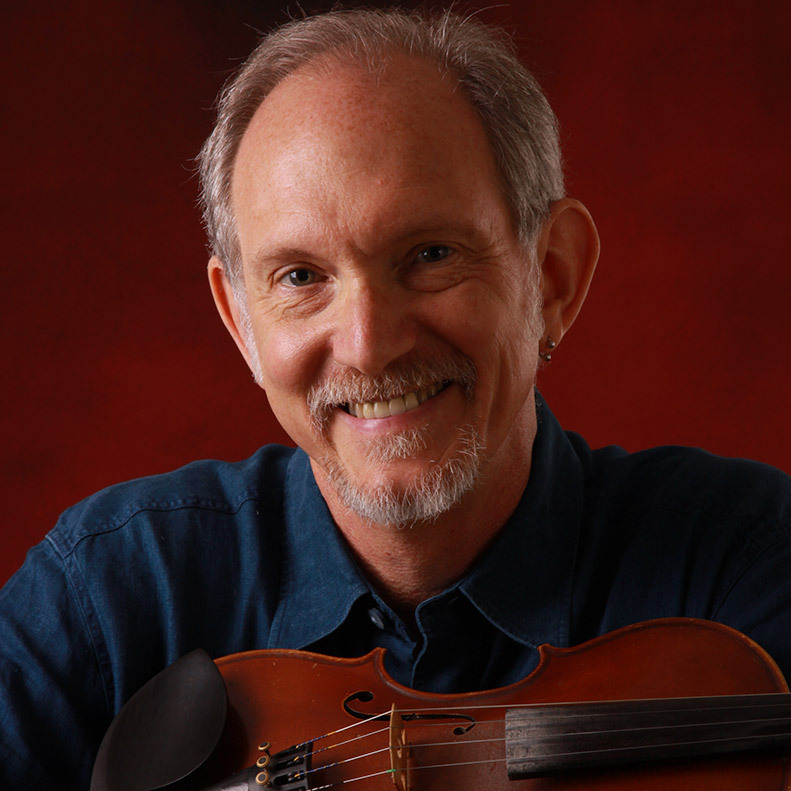 Says WBUR (Boston NPR), "It is no exaggeration to say that Bruce Molsky is one of the greatest American fiddlers of all time. His playing is mesmerizing and transporting, and best experienced live..."
Jeremy Kittel is an award-winning fiddler, violinist, and composer. The Compass Records recording artist is a master in Celtic, classical, jazz, and bluegrass traditions, and is gifted in fusing and revitalizing these diverse styles. Jeremy was a member of the Turtle Island Quartet for five years and has also worked with Mark O’Connor, Bela Fleck, Edgar Meyer, Chris Thile, Paquito D’Rivera, and My Morning Jacket. He has been a guest artist with several symphony orchestras, was twice featured on A Prairie Home Companion, and has performed around the world at venues as diverse as Carnegie Hall, the Kennedy Center, Bonnaroo and the Celtic Connections Festival in Scotland. Named “the future of the mandolin” by Mandolin Magazine, and dubbed “one of the most important young improvisers on the acoustic scene today” by mandolin grandmaster David Grisman, Josh Pinkham has established himself as a striking performer, composer and recording artist. He continues to push his mandolin into new and old territory, excelling in Bluegrass, Newgrass, Jazz and Classical music. Although Quinn Bachand plays a range of styles that include jazz and bluegrass, it is his talents in the world of Celtic music that draw the most attention. His unique harmonies, hard-driving strumming, inventive chord voicing and powerful rhythmic effects make even the most well-worn tunes seem new and exciting. He performs with his sister Qristina and has also toured nationally and internationally with Canadian fiddling icons Ashley MacIsaac and Natalie MacMaster. Daymark is an international trio performing traditional Irish music infused with infectious energy, raw power, and Northern swagger. Fusing the talents of Will Woodson (flute, border pipes), Dan Foster (fiddle) and Eric McDonald (guitar, vocals) the group presents a classic blend of wind and string as driving flute meets virtuosic fiddle, underpinned by expertly delivered guitar. Sharing a love for the music of generations past, in Daymark’s sound one can hear the echoes of Irish-American dance halls from the 1920s and 30s, alongside the lonesome tones of Donegal country fiddlers and the rollicking smoky pubs of Northern England’s immigrant neighborhoods. Each member of Daymark is well established in their own right, and collectively the three have lived and studied traditional music across Ireland, Scotland, England, America, and Canada. Foster hails from Northern England, and developed his music in the lively session scene there before honing his fiddle style in Limerick under master musicians. Woodson holds a master’s degree in traditional music from the Royal Conservatoire of Scotland in Glasgow, and in addition to his musical work is an established pipemaker, performing on an instrument of his own construction. McDonald is a native of Boston, and learned his music in the city’s sessions and folk clubs before studying at the famed Berklee College of Music. 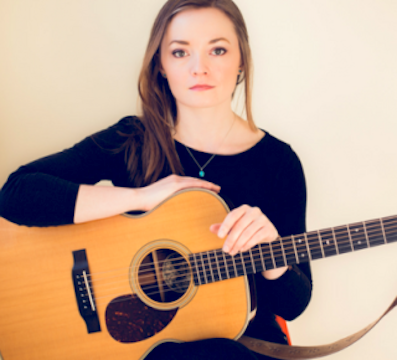 Ballads have been a source of inspiration for Lindsay Straw since her childhood in Montana, but she truly grew into the art while studying at the Berklee College of Music in Boston. There she began to tie together the threads of the traditions she was most passionate about: English, Scottish, Irish and American songcraft. She also founded a young Celtic trad band at the college, The Ivy Leaf, which she draws from to fill out the music on her new second album, "The Fairest Flower of Womankind." In addition to her own sensitive, agile accompaniment on guitar and bouzouki, Straw is joined by members of The Ivy Leaf, Daniel Accardi (fiddle), Armand Aromin (fiddle), and Benedict Gagliardi (concertina, harmonica), plus renowned Maine guitarist Owen Marshall (The Press Gang). Throughout, Straw’s tender vocals and careful arrangements draw out the inner depths of these old songs, telling tales of women from beyond the ages. Straw will be joined tonight by mandolin player Jordan Santiago. Mediumship, Motivation, Music, and Merriment! 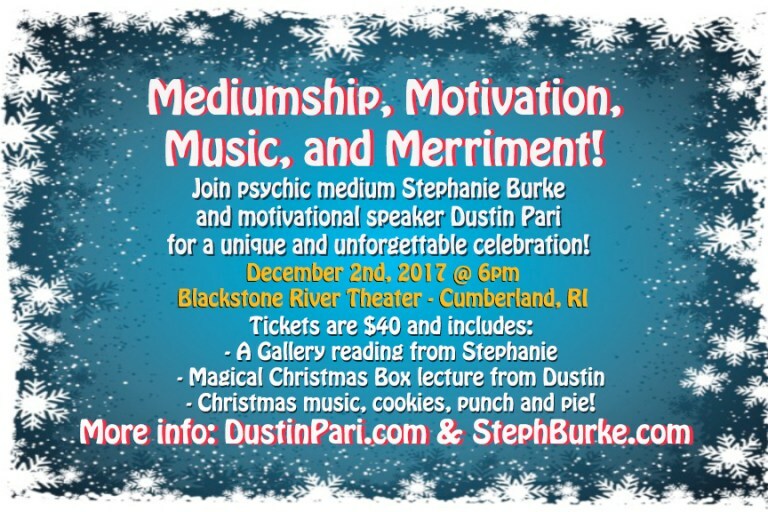 Join psychic medium Stephanie Burke and motivational speaker Dustin Pari for a unique and unforgettable celebration! This new Sunday 2 PM Christmas Celebration show has been added to our 7 PM show as we are cancelling Saturday's scheduled concert due to the snowy weather forecast. Cancelling/rescheduling is never an easy decision to make, but we will always choose the safety of our patrons, performers and volunteers first and it seems likely that there will be enough snow falling all day to make travel problematic, especially at night. We also cannot control when our parking lot gets plowed... so, we still have about 30 tickets left for Sunday's 7 pm show and NOW we have a new 2 PM show to fill.... we hope many Saturday reservations can attend Sunday instead! At Blackstone River Theatre's 10th annual Christmas Celebration audiences can expect the unexpected – familiar and unfamiliar songs, high energy step dancing and clogging, ancient carols, spoken word, jokes and more – as musicians and dancers perform in varied combinations or join together on beautiful Christmas and winter-themed pieces. "That's one of the nicest thing about this show," explains Russell Gusetti, BRT executive director. "We all get a chance to perform with each other in several different configurations, something audiences simply do not get to see at any other point in the year.” Get your tickets early ... both shows have sold out the last three years! At Blackstone River Theatre's 10th annual Christmas Celebration audiences can expect the unexpected – familiar and unfamiliar songs, high energy step dancing and clogging, ancient carols, spoken word, jokes and more – as musicians and dancers perform in varied combinations or join together on beautiful Christmas and winter-themed pieces. "That's one of the nicest thing about this show," explains Russell Gusetti, BRT executive director. "We all get a chance to perform with each other in several different configurations, something audiences simply do not get to see at any other point in the year.” Get your tickets early ... just 30 tickets left as of Friday afternoon!